From left to right, John Elbon, Steven W. Lindsey, Elon Musk, Charlie Preourt and George Sowers. 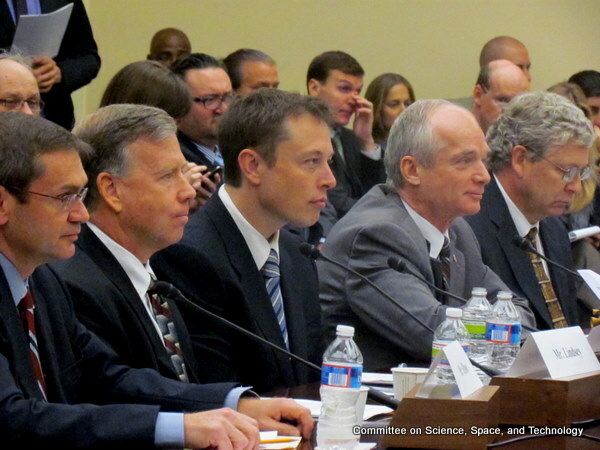 On October 26, the Committee on Science, Space, and Technology held a hearing to provide aerospace companies and NASA an opportunity to testify about progress being made toward the goal of establishing a commercial capability to fly humans to and from low Earth orbit and the long-term non-Government commercial market for private launch services. The Dream Chaser will also utilize an Atlas V for launch: “We selected the reliable Atlas V launch vehicle specifically for its heritage, demonstrated reliability, ability to human rate, and compatibility with the DC spacecraft. This Nation has launched multi-billion dollar national assets on the Atlas due to its reliability. The Atlas has demonstrated 98 consecutive successes since 1993,” he said. NASA’s internal studies using the NASA-Air Force Cost Model (NAFCOM) concluded that it would have cost NASA $1.7B to $4B to develop the Falcon 9 rocket. By contrast, in partnership with NASA’s COTS program, SpaceX developed the Falcon 9 for approximately $300M.2 It bears noting that the Falcon 9’s development included designing, building and testing SpaceX’s Merlin engine, the first new all- American hydrocarbon engine for an orbital booster in forty years. The Dragon LAS is a vehicle-integrated, side-mounted engine system selected for its safety, reliability and performance after a system-level analysis conducted by SpaceX. Eight abort engines (known as SuperDracos because they are modified versions of Dragon’s existing Draco thrusters) are located around the periphery of the Dragon service section and fed by hypergolic propellant stored in the spacecraft propellant tanks. SuperDracos will carry the spacecraft away from the booster and are capable of separating the Dragon crew spacecraft from a failing booster while on the pad all the way through nominal on-orbit separation of Dragon from the second stage. The LAS will be enabled after crew ingress and securing on the pad and will be disabled on orbit after Dragon separation from the second stage. The launch vehicle malfunction detection system for automatic abort will monitor the Falcon 9 and Dragon for engine failures, flight control failure, failure of the booster propellant tank and failure of the booster’s primary structure, among other signatures. One of the largest safety distinctions between the Falcon 9 and Dragon system over the Soyuz transport system is the reduction in separation events – failure of separation events is one of the most common events leading to mission failures of space systems. The Soyuz launcher and spacecraft must release four side-mounted booster modules, the second stage, the third stage, the launch escape tower, fairing, propulsion module and habitation module prior to the point where the crew can enter safely in the Soyuz descent module. For the Dragon and Falcon 9, there are only four separation events which must occur prior to the Dragon’s entry: separation of the first stage, second stage, external cargo module or trunk and for a nominal mission separation of the nose fairing. Liberty is a simple, inherently safe, two-stage launch vehicle. Its first stage is the five- segment solid rocket booster derived from the Space Shuttle and Constellation programs. The upper stage is the core liquid engine stage used in ESA’s Ariane 5 program. Having both stages based on existing, flying systems dramatically lowers the remaining development costs as there are only minimal changes necessary to integrate the stages to form Liberty. Both stages were designed from inception to NASA’s human-rating requirements (Shuttle, Ares I and the Herrnes Space Plane that was originally envisioned for launch of ESA’s astronauts). This heritage enables unmatched crew safety. According to Precourt, the design can be completed and result in a full CDR-equivalent launch vehicle in less than one year, provided that two milestones are reached, namely “the validation of design modifications that provide structural attachment of the two stages, and modifications enabling in-flight start of the upper stage” (in the Ariane 5 configuration the Vulcain engine is ground-ignited). “Liberty draws its high safety from a simple design with an absolute minimum number of “moving parts,” which provides the lowest potential loss of crew. The resulting design is more than 10 times safer than shuttle and even safer than the Ares I vehicle projections, due to the use of established stages (Valador Study, April 201 1).The use of the solid rocket first stage also provides a trajectory that enables survivable aborts throughout ascent to orbit, alleviating the black-out zones that are prevalent with full liquid launch vehicles. The NASA acquisition strategy of soliciting a full end-to-end service for commercial crew tends to stovepipe the design solutions offered, and does not facilitate interoperability. Interoperability is one of the major enablers for commercial success in the launch vehicle business. That is, a launcher should, through use of common interfaces, be able to fly multiple cargos with low recurring integration expense. Similarly, to enable a robust sustainment of the ISS, interoperability between launchers and spacecraft should be encouraged. Common interfaces will be difficult to achieve with an acquisition strategy that seeks offerings of an end- to-end service. As an alternative, NASA could leverage some acquisition aspects of their existing NASA Launch Services (NLS) program, which has the ability to consider more than one launcher for a given payload. This kind of robustness would largely mitigate the potential risk of abandoning ISS as recently was confronted with the Soyuz failure. By choosing to fund only spacecraft forthe CCDev-2 portion of the development program, NASA has placed a higher obstacle before the launch vehicle providers. From a human rating and flight safety standpoint, the launcher development is significantly more challenging technically than the spacecraft. This is because the preponderance of risks to the crew during launch, which must be mitigated, emanate from the launch vehicle. The U.S. has not certified a human spaceflight launch vehicle other than the space shuttle in three decades. This is not only an issue for our company, but for all of those involved with commercial crew. Whether one is developing a launch vehicle or a capsule, the entire system must be successful for any one element to succeed. We are also making excellent progress on the relatively few modifications to the Atlas required to accommodate human launch. These include the development of the emergency detection system (EDS), a health monitoring system that will provide a signal to the spacecraft to abort if a launch vehicle failure is imminent. A prototype of this system was demonstrated last year in our high fidelity systems integration lab, correctly detecting a wide range of potential failures and sending the abort signal in time to ensure a safe abort. We are progressing on the design of the modifications required at the launch pad to accommodate getting crew into and out of the spacecraft. And we’re working with several spacecraft providers on the details to integrate their systems to the Atlas. The commercial crew program represents a shift in near Earth operations to the private sector, freeing NASA (and NASA’s limited resources) to pursue other human space flight goals, including utilizing the Space Station and setting out on missions of exploration. Within this new paradigm, NASA will maintain its stringent safety requirements and standards. We have always used contractors to build our space systems. In these programs, we are planning to use an acquisition approach that will allow the contractors more freedom to pursue cost-effectiveness, but still allow NASA the appropriate level of insight and oversight to ensure that the systems will be safe. Developing crew transportation systems to achieve LEO does not require any significant technological breakthroughs which is a key factor in using a unique insight/oversight approach. We will maintain crew safety by way of a crew transportation system certification, and no system will receive this certification until NASA has confidence that our personnel will be safe. To implement the lessons learned from Apollo, Challenger, and Columbia relative to the independent oversight of design, test and certification, CCP will map program processes to the Agency’s programmatic guidelines for all NASA spaceflight programs (NASA Procedural Requirements 7120.5, NASA Space Flight Program and Project Management Requirements) while working to minimize bureaucratic hurdles. These processes will include independent review of the commercial providers’ performance of key milestones and major technical risks to crew safety. NASA CTS certification will evaluate and assure that the commercial provider’s CTS design and implementation can safely conduct the required crew transportation mission. NASA CTS certification includes evaluation of design features and capabilities that accommodate human interaction with the CTS to enhance overall safety and mission success. NASA, through our CTS certification process, is fully accountable for the safety of the NASA crew on CCP missions. The nature of the FAA involvement in NASA’s commercial crew activities will vary through the development and operation of each potential flight system. NASA will establish initial certification and operations requirements for the services it wishes to acquire from commercial providers. NASA will partner with the FAA for the purposes of determining common standards and uniform processes to ensure both public safety and protection of crews and spaceflight participants for the NASA-sponsored missions. NASA and the FAA will work towards minimizing the duplication of requirements, developing a streamlined process and addressing indemnification issues. You can watch an archived webcast of the hearing in Windows Media Video.